Disclosure: I was provided with Honey Bunch of Oats Prize Pack with products to facilitate my review. All opinions are 100% my own. I know that breakfast is the most important meal of the day. I know that, ideally, my breakfast would be a good combination of protein and fiber to fill me up and keep me going strong all morning. This is especially true on days I run, and I need the energy and strength. Yet, mornings are my worst time of day. On a good day, I have 45 minutes to get the girls up, dressed, fed and ready to get to the bus stop. This may seem like a lot of time. But what you are not considering, friend, is the battles that ensue on even these good mornings. The outfit that I purposely helped Chica pick out the night before suddenly doesn't suit her fancy. So instead of quickly and quietly finding a new outfit, we must endure a tantrum complete with tears and a refusal to get dressed. We finally make it downstairs, and the girls hem and haw over what to eat for breakfast. Nothing in the pantry appeases their tastebuds. More crying ensues. As the clock rolls forward, I get scolded for not brushing hair the right way, and the only pair of shoes Bug will wear are no wear to be found. Really, it's amazing that we leave the house dressed and in one piece each morning, let alone with full bellies. And, mind you, this is on a good day where the girls wake up happy and at reasonable times (unlike the last two weeks, where we are still recovering from Daylight Savings). Needless to say I was excited to hear about Post's new Honey Bunches of Oats Morning Energy cereals. 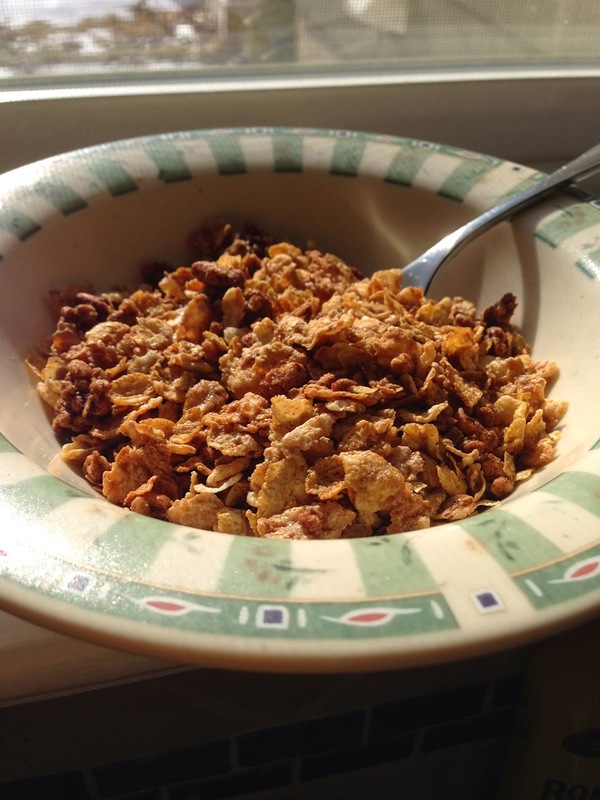 Hands down, cereal is the best kind of breakfast in my book, because it's easy and can be taken on-the-go if need be. 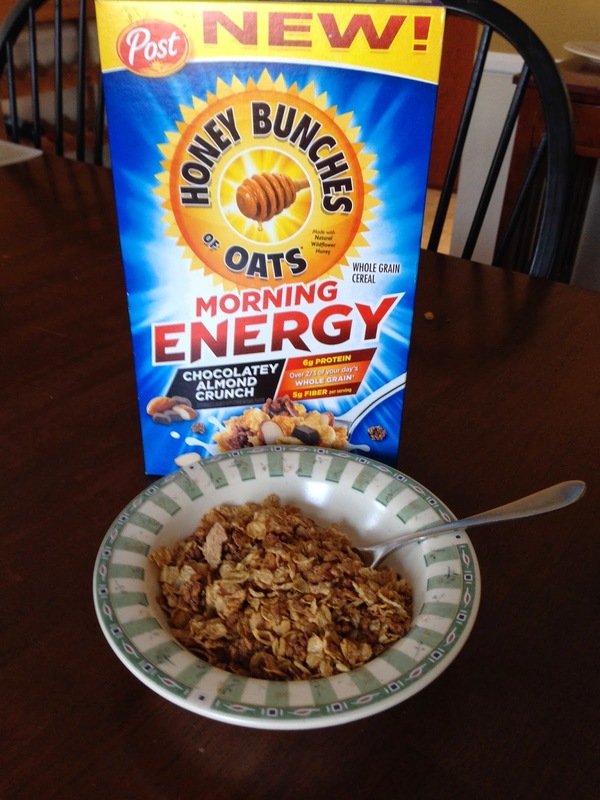 Honey Bunches of Oats Morning Energy packs an extra punch, with over 2/3 of your day's whole grains, 6 grams of protein and 5 grams of fiber per serving. Remember what I said about protein and fiber? 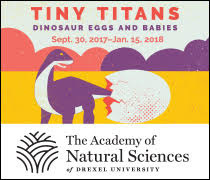 The best part is that they are tasty. I'll be honest: most cereals that tote themselves as "healthy" and "full of fiber and protein" taste like cardboard. 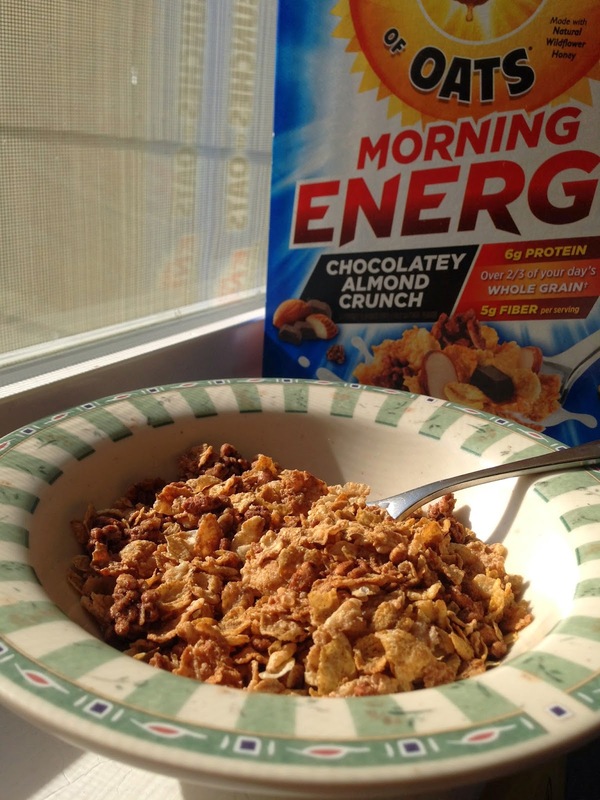 Both flavors of Morning Energy, Chocolatey Almond Crunch and Cinnamon Crunch, are delicious. It was hard not to quickly reach for a second bowl! My girls love it, so it takes the guess work out of, "What's for breakfast?" Since it is low in calories and filled with whole grains, protein and fiber, I can feel good about what I'm giving them. Heat oven to 425 degrees. 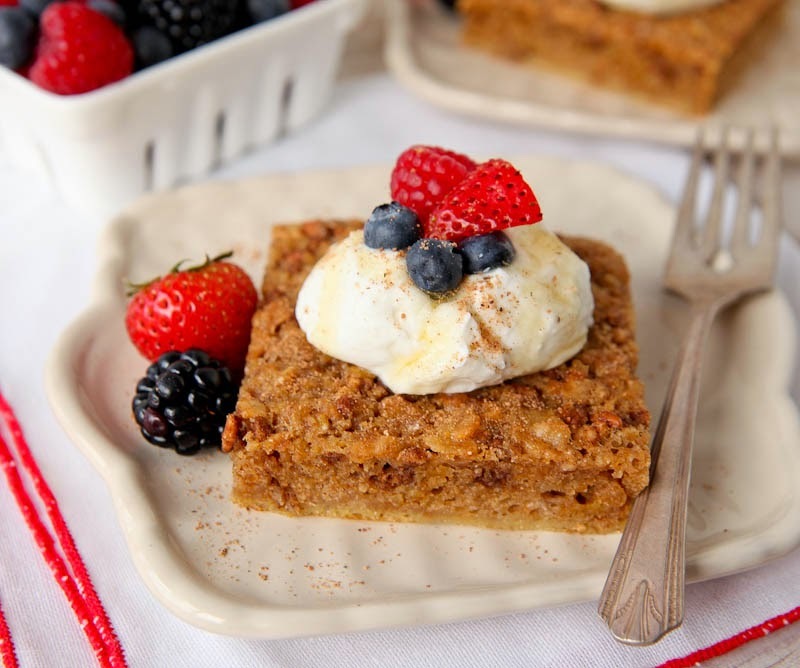 Lightly butter and flour an 8-inch square pan, or coat lightly with nonstick cooking spray. In a mixing bowl, stir together the cereal, flour, baking powder, salt, sugar and cinnamon. While stirring, slightly crush the cereal using the back of the spoon or rubber scraper; set aside. 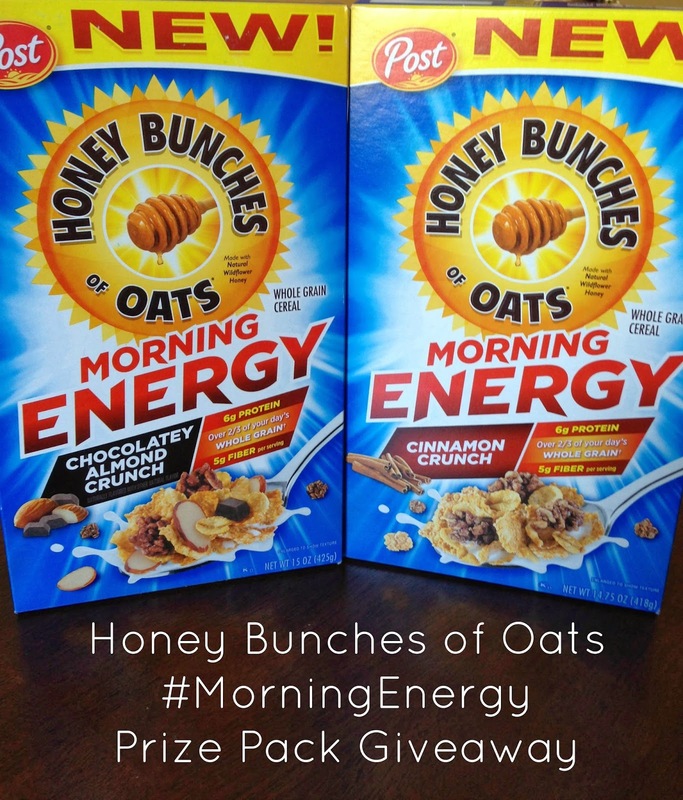 You can find Honey Bunches of Oats on Facebook and keep up with them on Twitter at @HBOats #MorningEnergy. For more recipes, check out their Recipe Page!